The Russians can actually laugh at themselves, who would’ve thought? I really should have known better than to hope for so much, after all it was just setting me up for disappointment. The closing ceremony however was a pleasant surprise. 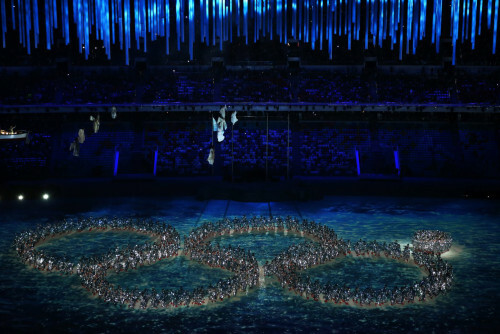 When the children formed the Olympic rings, and delayed the opening of the fifth ring (pictured above), that indicated to me that, despite appearances, the Russians did in fact possess a sense of humour. What followed was a beautifully-executed reminder of Russian culture, featuring music, ballet, and references to Russian literature. I could be biased simply because I’m really into ballet, and one of my favourite piano concertos was featured (Rachmaninov’s 2nd), but when it came to the end and Mischa the bear shed a tear (a throwback to the closing ceremony of the Moscow games of 1980), I was genuinely sad. As for the sporting side of things, I took it upon myself to write about the games in my capacity as an ex-athlete and now as a coach who is very close to the speed skating world, and still has vivid memories of Vancouver. I posted daily updates, as well as ‘specials’ in which I invited readers to ask questions about the sport and I would attempt to answer them, hopefully to educated the general public about a sport that doesn’t really get any attention outside of the games. The first of these articles concerned the recently-revealed under armour suits, worn by team USA. 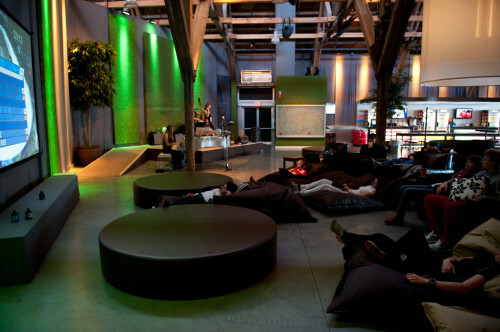 High-tech, ultra-sleek, and designed with input from Lockheed Martin, these were supposed to give the Americans a competitive edge in competition. My take on it? They might make a very small difference, if the margins end up being very close, like in the hundredths, but other than that, the claims were just run-of-the-mill marketing hype. 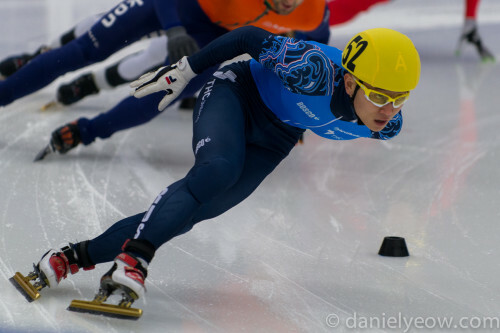 The first day of speed skating competition kicked off with the men’s 5000m, and the result set the tone for the rest of the competition. The Dutch dominated with some classy skating and took their first podium sweep, led by defending champion Sven Kramer. The Norwegians and the Germans actually did very well, improving on their times from world championships at the same venue last year, but were unlucky in the sense that the Dutch skaters were really in a class of their own. The ladies 3000m, while not a clean sweep, was also won by a dutchie – Ireen Wüst, who picked up her first of a staggering FIVE medals. The sprint events came next with the mens 500m, and after an agonising (to watch, and probably to experience too) fall by former team mate and training buddy of mine, Daniel Greig, another good friend of mine, Michel Mulder, picked up the gold medal by the slimmest of margins (or so we thought at the time) ahead of Jan Smeekens and identical twin brother, Ronald Mulder, in yet another dutch podium sweep. The ladies 500m was not won by a dutchie, but by the impressively-dominant Lee Sang-Hwa who hasn’t lost a 500m in a while, Margot Boer from the Netherlands did manage to pick up a bronze, the first ever dutch medal in the ladies 500m, ensuring that the dutch didn’t miss out. In the meantime, I collaborated with Canadian skater Remi Beaulieu who has skated both short track and long track at a high level, to produce the second ‘Sochi special’ describing in excruciating detail the differences between short track and long track speed skating – a difference which is pretty obvious to those who are in the sport, but not-at-all obvious to those who are watching at home. Intended less as a happening news item, but more as a reference to which people can point for a detailed answer to a very commonly-asked question of speed skaters of both the long, and short track variety. Neither 1000m races was a clean sweep, although not for lack of trying. The mens 1000m was won by Stefan Groothuis, while Denny Morrison won the first non-dutch medal in the men’s competition, with Michel taking the bronze. The ladies 1000m was surprisingly smashed by Chinese skater Hong Zhang, and then followed by Wüst and Boer – two more medals for the Dutch. Of course, big favourites Shani Davis (world record holder), Heather Richardson, and Brittany Bowe (world record holder) from the US did not collect any medals, despite recording faster times than they did at the same venue last year, so that was a big disappointment. There was also a small amount of controversy surrounding Gilmore Junio’s sacrifice of his qualification spot so that Denny could race. Fortunately Gil came out and cleared things up, declaring that it was always his intention to give his spot to Denny, since Denny had fallen during Olympic trials. In the background, history of another kind was being made when Viktor An of Russia (previously Ahn Hyun Soo of Korea) picked up a bronze medal in the 1500m on short track. I didn’t feel enough of an authority on short track to really write about it, although I do follow it and love to watch the races. Ahn won three gold and a bronze in the 2006 games in Torino, and with five overall world championship titles in short track, was already considered one of the sport’s all time greats. Not quite having the top speed advantage of his younger years, he still was able to (seemingly effortlessly) pull passes that nobody else would even dream about. The rest day between the 1000m and 1500m events on long track brought controversy in the form of a Wall Street Journal article implicating the Under Armour suits in team USA’s poor performance. I made the mistake of pointing the blame for what was clearly a ridiculous claim at the journalists who wrote the article, and had to apologise for it.3 Instead, I should have pointed the finger at US speed skating for letting the story break the way it did, and also for some (how to put this delicately) interesting decisions that it took regarding preparation coming into these games. Introducing brand new, untested suits to skaters just before the Olympics was really just the tip of the iceberg. In any case, it wasn’t about the suits, and in an interview with Dutch coach Jillert Anema, a great quote surfaced: “We have found something that makes the suit very fast – it’s the man in the suit”. Just when we thought margins of victory couldn’t get any closer, Zbigniew Brodka of Poland edged out Koen Verweij of the Netherlands in the mens 1500m by an agonising three thousandths of a second. Immediately following this, I had an interesting conversation with a friend about whether or not it was fair to differentiate performances based on such a small margin, and it prompted me to write another feature article, this time addressing the timing equipment. The ladies 1500m had no such controversy and the Dutch went one better than a podium sweep, by taking the top four spots. More than that, the gold medallist was Jorien Ter Mors, only the second person in history to skate both long track and short track in the same olympics, and the first to win a gold medal (sorry Harry). She had skated three 1000m heats, prelims, and quarterfinals for short track on the previous day, but somehow pulled out an amazing time which would have easily smashed Cindy Klassen’s 9-year-old world record, had it been skated at altitude. In the next ‘break’ day, I decided to set things straights once and for all regarding the suits. I had been in some heated discussions on various internet fora regarding regarding my claim that the suits don’t make such a big difference, and even though those with whom I argued weren’t generally given to evidence-based arguments, I was, so I embarked on a detailed numerical analysis of the recent races of Shani Davis. I broke down the lap splits for his 1000m and 1500m races over the span of about five years, and graphed his speeds to show that the suit had no impact on his performance. In fact, nothing had really had an impact on his performance, he had skated remarkably consistently and well for the last five years. The only thing to be ‘disappointed’ about was that there were a few other skaters who were faster on the day. In a surprise move, Joey Cheek (500m gold medalist from 2006) tweeted my article, and it was retweeted by Erben Wennemars (ex-Dutch speed skater, and very famous throughout holland). The extra traffic briefly crashed my website, but to my surprise, I wasn’t flamed nearly as much as expected for daring to question the “it’s the suits” hypothesis. 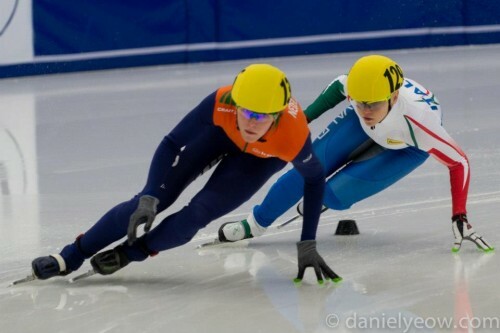 The men, not to be outdone by the ladies, swept the podium again in the mens 10000 meters, with Jorrit Bergsma disappointing Sven Kramer, who had hoped to redeem himself after his disqualification in Vancouver for skating into the wrong lane (at the instruction of his coach). Sven showed classy sportsmanship when he immediately went up to Jorrit and embraced him in a congratulatory hug. Bob de Jong rounded the sweep with his bronze, making it four medals from five olympic games. The ladies 5000m was won by defending champion Martina Sablikova of the Czech Republic, who triumphed convincingly over Ireen Wüst and 35-year-old Carien Kleibeuker who picked up two more medals for the Dutch. In the world of short track, Ahn picked up the gold medal in the 1000m bringing Russia its first gold medal in short track (his bronze was Russia’s first medal) and Ahn his fourth career gold medal. Sjikie Knegt picked up the Netherland’s first short track medal with a bronze in the same event. The ladies 3000m relay was an interesting switch from the incidents of Vancouver with the Koreans being victorious over the Chinese, and the Chinese being disqualified (in Vancouver, China had won the gold, and Korea had been disqualified). In the background, Canada moved up to second place, and there was some controversy with team selection as Jessica Gregg was not selected for the relay team, despite posting the second fastest 500m in the world that season, after Wang Meng of China who wasn’t in attendance because she was injured a month prior to the games. At least the Canadians didn’t mysteriously fall for no reason, which had been happening to many Canadians in the short track competition, possibly because their skating style was ill-suited to the Sochi ice conditions. I even wrote a short special on why certain types of skates chew up the ice more than others. The final long track events were the team pursuits which were exciting and closely-fought. In the preliminary rounds, the Dutch so impressed me that I was forced to backtrack on my original predictions and tip the Dutch for the win. I had previously tipped them for not-the-win because history had shown that, despite often having the fastest skaters, they were not always good at working together. At this games at least, they seem to have overcome these difficulties and easily won all of their rounds, often breaking the Olympic record. In the final, the Dutch ladies dominated Poland, who had done well to edge out Russia who had to settle for bronze. The Dutch men fought Korea in the final, and for the first half of the race, both teams were within a handful of hundredths of each other, but the Dutch prevailed, leaving Korea with the silver medal, while Poland triumphed over Canada for the bronze. Meanwhile in the short track world, Jorien was unable to make it to the final of the 1000m (possibly from being tired after all those gold-medal performances on the long track?) and invited the ire of the Dutch when she said that she would have preferred a bronze medal in the short track, rather than the gold medal in the long track. (mind you, if you’re a Dutch medal-counter, this is beneficial because taking her out of the 1500m would have still resulted in a Dutch podium sweep, and an extra medal from the short track is an extra medal). One of the other favourites, Elise Christie of Great Britain was disqualified under unusual circumstance and was not able to advance to the final either, leaving the ladies 1000m to finish Korea – China – Korea. The mens 500m was won by Ahn, who got off to a terrible start, but managed to hang at the back of the pack, then, after a Chinese skater fell, was able to easily pass up into first place (at breakneck speed) and win his 5th gold medal, and first gold in the 500m. The relays were an unusual race, since, due to falls and penalties, two of the strongest teams – Korea and Canada, were in the B-final and weren’t able to contest for the medals. In the A-final, the not-so-usual suspects of Russia, Holland, Kazakhstan, China, and the USA (ok, China and the USA were expected to make the final). After a fall in the very first corner, the event became a two-horse race between the US and Russia. They swapped leads briefly, but with a skater like Ahn on your team, the result was never in question, and US speed skating got its only medal from these games. The crowd raised the roof as Russia picked up an unprecedented 4th medal in short track, and Ahn picked up his 6th career gold medal, and 8th olympic medal, cementing his position as the greatest short track skater ever to walk the earth. I, too, rounded out my own coverage with ‘lifestyle’ articles in the specials section. First giving readers insight into what the day-to-day lives of speed skaters are like including a few tidbits about training programs and what makes good elite athletes, what the experience of the Olympic village is like, at least for a speed skater, and finally from the audience’s side, a broad list of complaints about how the coverage of the games has been (spoiler alert: it hasn’t been great). 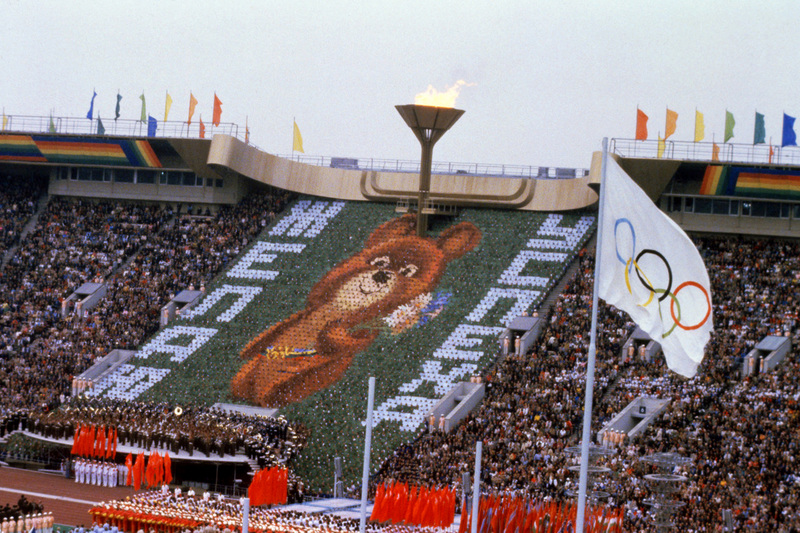 I hope readers have enjoyed by Olympic coverage at least, I’ve tried to be as unpartisan and even-handed as possible, and tried to use my knowledge to enrich readers’ experience of the games.